The Laboratory of Climatology and Atmospheric Environment(LACAE) of the National and Kapodistrian university of Athens, in collaboration with the National Observatory of Athens, the Hellenic Centre for Marine Research and the Mariolopoulos - Kanaginis Fountation for the Environmental Sciences, co-organized the MedCLIVAR 2016 conference. 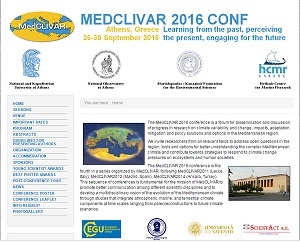 The Conference was held held from 26 to 30 September 2016 at the University of Athens and it was the fourth conference in a series organized by MedCLIVAR, following MedCLIVAR2011 (Lecce, Italy), MedCLIVAR2012 (Madrid, Spain), MedCLIVAR2014 (Ankara, Turkey). 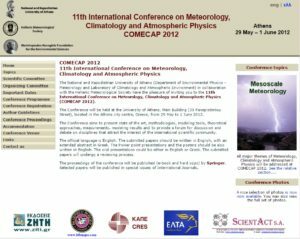 The Conference was held at the University of Athens, from 29 May to 1 June 2012.